Ever since Steven Moffat took over as head writer of Doctor Who, the show's been trying to be a "dark fairy tale." And the main sort of magic in Moffat's fairy-tale Who has been time-travel, with its arbitrary rules and get-out-of-jail-free cards. But after tonight's episode, I'm finally tired of "jargony-wargony" writing. Seriously, while watching "Journey to the Center of the TARDIS," DO NOT TOUCH YOUR NOSE THREE TIMES. Anyone who touches their nose a third time during the watching of this episode will intubate their time nexus and super-circumvent their own synchronicity. The aforementioned makes about as much sense as most of "Journey to the Center of the TARDIS" did to me — there's actually a whole scene where the Doctor stands around yelling at the guest stars not to touch each other, "or time will reassert itself." I'm going to be worried from now on about ever touching other people — because I'm absolutely terrified that time might reassert itself. Time is already quite assertive enough as it is, in my experience. I quite liked bits of the "evil wifi" midseason opener, and liked about half of "Rings of Akhaten," all of "Cold War," and almost all of "Hide," except the ending. So this episode is a bit of a disappointment, after a moderately decent run of episodes. And a big part of the disappointment comes from the overuse of the time-travel bafflegab. The notion of time being this magical thing, with absurd rules, has been played up a lot in the Moffat era. The Doctor has to be assassinated by a Lake in Utah by River Song, rather than just being shot on a random streetcorner by some dude with a gun, because that's a magical time-spot. The Doctor can't just go to New Jersey in 1934 and then take a train to Manhattan to grab Amy and Rory, because there's a magical time thing. (And River Song has to write a whole detective novel explaining what's happened, because of timey wimey, too.) It's all gotten a bit arbitrary. Not that time travel shouldn't have rules — but they should be rules that make sense. Like you can't interact with your past self, or intersect your own timeline directly. Which is a rule that Moffat's Doctor Who breaks constantly, and is incidentally the rule that's broken at the climax of "Journey to the Center of the TARDIS" to provide the magic reset button and undo all of the story's events. If it was harder for the Doctor to solve all his problems by crossing his own timeline, it might result in some better storytelling. In retrospect, the best time-travel story of nuWho is probably "Father's Day," where Rose goes back and saves her father from a car accident that happened when she was a baby. It's clear, strong storytelling — she makes a bad choice, there are terrible consequences, and in the end a sacrifice is required to set things on track again. That episode adds to our understanding of Rose as a character, and also gives us a new window on the Ninth Doctor's mix of rage and compassion. We haven't had a time-travel story like that in quite some time. In "Journey to the Center of the TARDIS," there are these three salvage workers, the Van Baalen Bros., and they seize the TARDIS in their Magna-Grab (TM) when the Doctor shuts all the TARDIS' systems down to "basic" so Clara can drive. As a result, the TARDIS is badly damaged, and Clara is trapped inside. The Doctor sort of blackmails the salvage crew into looking for her with a fake self-destruct sequence — only to find out that the TARDIS is really going to explode after all. The good part is Clara wandering around the corridors of the TARDIS, feeling freaked-out and trapped, while the cloister bell is ringing and the ship is getting more and more spooky. It sort of recalls the "trapped in the TARDIS corridors" sequence from "The Doctor's Wife," along with various classic-series episodes, but it's neat — and the weird ash creatures chasing Clara are kind of scary, at first. And I liked the TARDIS library, with the weird books in bottles and the history of the Time War. Unfortunately, nothing else in this story makes any sense. Including why the Doctor goes to so much trouble to enlist the aid of the Van Baalen Bros. Sure, there's toxic fumes or whatever — but he deals with those on his own, in about 30 seconds. And then the Doctor first promises them the "salvage of a lifetime" (by which he means Clara, not the treasures of the TARDIS) and then activates a bogus self-destruct system. I guess there is some hand-wavy dialogue about how the whole ship is still toxic, but it mostly seems perfectly safe. And it's unclear how the Doctor thinks three guys will improve his odds of finding one person in an infinite maze, within 30 minutes. 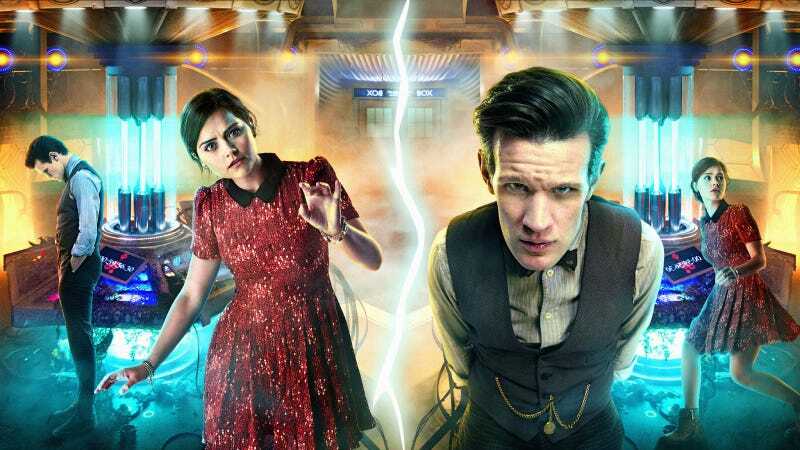 From the time the Doctor activates the bogus self-destruct countdown to the time he finds out the TARDIS actually is going to self-destruct, it feels like the episode sort of grinds to a halt while we mostly deal with the threat of the salvage crew attempting to salvage bits of the TARDIS. Which, the Doctor already promised them the whole ship is theirs if they help him — so he's really in no position to object to them taking whatever they find. And the whole "the salvage crew make the TARDIS upset by trying to take stuff" subplot basically kills the momentum of the episode — if Clara is really in mortal danger, why is the Doctor bothering to fuss about people trying to take bits of his ship? Since Moffat took over as showrunner, the thread of the Doctor being a monster-jerk has been built up over time — he's the guy who brags about himself whenever he's in a tight spot, he's gotten too big, he litters, etc. — but this episode, written by Stephen Thompson, is the first time the Doctor just seems like an out-and-out evil jerk, who drags the Van Baalens into a potentially lethal situation by lying and bullying. Sure, the Van Baalens are also terrible people, especially Gregor, but that doesn't excuse it. Basically, the episode lacked a sense of threat without throwing in a monster, so we get the Future Zombie Burn Victim Clara, who manages to kill a man twice her size somehow. And then there's the bit towards the end where the Doctor is screaming at Clara, and she says "I think I'm more scared of you than anything else on that TARDIS." And you think maybe she's actually going to show some normal human emotions for once. (Unlike before, when she found out he spied on her mother's funeral and her reaction was just to say "I'm not going to be bargain basement second best!") And then he hugs her, and she says "the hug is really nice." A hug from the person you're more scared of than your own future zombie burn victim selves is really nice? Really? You have to have a certain tolerance for the "reset button" school of storytelling, when it comes to time travel stories — it sort of goes with the territory, but it's nice when the use of the reset button requires a bit of cleverness or enterprise on the part of the person mashing it. Also, it's the opposite of nice when the reset button goes along with a lot of blather and fake rules, which is what happens here. Don't touch your nose three times! Honestly, the time travel on this show is starting to require a large dose of the chronic. And the thing with the remote burning Clara's hand feels a bit of a cheat — she picks up the remote at the start of the episode, when it apparently doesn't have any writing on it, but the writing slowly appears over the course of the episode because a timeline is taking shape where the Doctor wrote "big friendly button" on it. But the remote wouldn't have been aboard the TARDIS in the first place if the Doctor hadn't put it there. He says he found it in one of the Van Baalen brother's pockets, at the start of the episode. So there shouldn't be a timeline where the remote rolls across the console room but doesn't have writing on it, or a second Doctor to explain its use. Right? Time will reassert itself! Time has been taking assertiveness lessons! Time even practiced elocution and had to give a speech! In any case, all good — reset button pressed, everything returned to normal. And apparently, the main takeaway from this episode is: 1) In case you forgot all the stuff Neil Gaiman taught us about the TARDIS having a personality, here it is again. 2) The Doctor once again thinks Clara is a trick or a trap, and she isn't. At least, to her knowledge. (And the reason the TARDIS doesn't trust Clara is probably because the Doctor doesn't.) 3) The book of the Time War contains some secret about the Doctor, which relates to his name and thus to the whole Fields of Trenzalore thing. When the current run of Doctor Who stories treats time as this magical force — with nonsensical rules that are made up on the fly — it's not even good fantasy writing, because proper fantasy stories respect magic and treat it as something consistent that never gives you an easy "out." This sort of story degrades the integrity of the Doctor as a hero, and of the universe he lives in.